The teenager is involved with an organised crime gang. 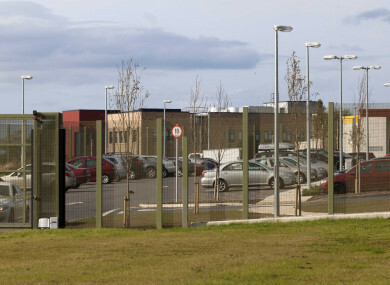 STAFF AT THE Oberstown detention centre in north Dublin have been informed that one of the child detainees has a €25,000 contract on his life, TheJournal.ie has learned. The child, who was sent to the centre due to his violent behaviour, has been involved with an organised crime gang and it is understood that staff at the centre now have to make additional security measures to make sure he is protected. It is understood that staff have concerns that they would not be able to protect the child in the case that an attack would happen. The child has to attend court frequently and no additional safety measures have been made to his transport routine as a result of the threat to his life. A number of makeshift shivs have been found on the campus in the last six weeks. While there is no evidence to suggest that they were to be used to attack the teenager, staff cannot discount that the young man was being targeted. Sources have told TheJournal.ie that the highly-volatile detainee is aware that there is a threat to his life but said he would be considered “relatively safe” on the campus as the number of young people who share services such as education or sport is limited and those who seemingly get on with each other are often mixed together in a bid to limit the possibility of any outbursts of violence. Staff at the centre have been urging management install safeguards. A review of the centre, ordered by Children’s Minister Katherine Zappone, found that a serious lack of resources meant that recommendations identified in the review could not be implemented. It read: “The limited available resources – both human and financial – have also been identified as a barrier to the implementation of some recommendations. This is evident in a number of ways. First, Oberstown resources are finite and can only be stretched so far given that it is the priority of the campus to provide 24/7 safe and secure care to young people referred by the courts on a day-to-day basis. “In this way, the balance must be carefully struck between ensuring that Oberstown provides the best possible care to young people today, while continuing to advance the development of the Campus for the future. “Limited resourcing is relevant therefore to the limits on the capacity of staff – to undertake training and to bed newly acquired learning into practice – and the extent to which financial resources could and should be made available to advance the review recommendations, especially bearing in mind any risks to the standard of care currently provided. The Department of Children and Youth Affairs said that has not published the most recent report into the operation of Oberstown, which was received in April 2018. Email “Child at Oberstown detention centre has a €25,000 contract out on his life”. Feedback on “Child at Oberstown detention centre has a €25,000 contract out on his life”.